Hi All, I know it’s been a while since I got a chance to talk to you, but between Bridgy practically accused of murder and the moms coming to town, well let’s just say life around the Read ’Em and Eat has been a wee bit hectic. You met my mother, who is currently going by the name “Sage”, when she stopped by Killer Characters just last month. She flew down from Brooklyn recently with Bridgy’s mom, Emelia. I have to tell you Bridgy is stressed to the max. First, while searching for her lost sunglasses, she stumbled upon Oscar Frieland’s dead body. And now she’s being questioned like a zillion times by the Lee County Sheriff’s department. I personally don’t understand why Lieutenant Frank Anthony is so focused on Bridgy. Even someone as regimented as he is must realize she wouldn’t harm a fly. I do know that having her mom around has been a great comfort to Bridgy but both Emelia and Sage interfere more than we’d like, especially when it comes to what they think of as the lack of romance in our lives. They claim Bridgy and I work too hard and don’t spend enough time flirting and dating. They seem to forget we have a café and bookshop to run. Still, I’m sure they only have our best interest at heart. To meet the moms and read about the murder of poor Oscar, pick up a copy of Read to Death from your library or favorite bookstore. And if you have never come to Fort Myers Beach to hang out in the Read ’Em and Eat, sit in on a book club meeting or feast on sweet tea and a piece of buttermilk pie, well today might be your lucky day. 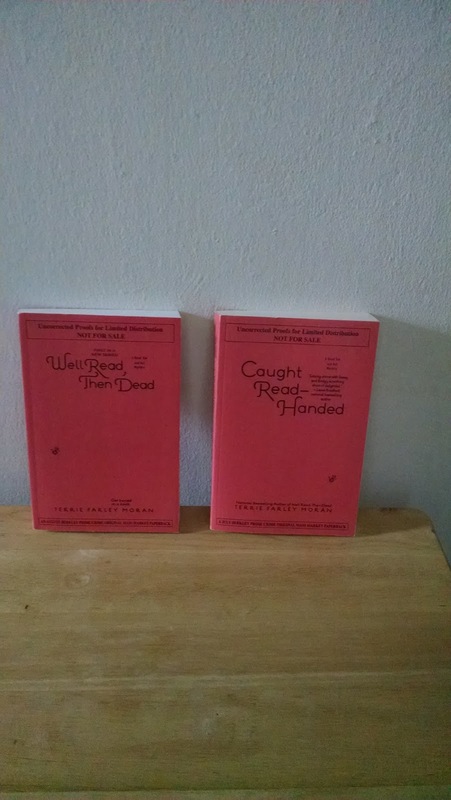 Our author, Terrie Farley Moran, has some Advanced Reader Copies of Well Read, Then Dead, and Caught Read-Handed. Now these books are uncorrected proofs and don’t have pretty picture covers but I guarantee you will love the stories inside. Comment on this post to let us know which book you would like to win. Please include your email in this format: your name (at) your server (dot) com--so the spambots can't pick it up. There will be two winners. Each winner will receive an ARC of the book he or she mentioned in the comments. Comments close on Monday August 22nd. Well Read, then Dead, I'd love to win this one. Thanks for the chance. Wow, they all look good but I'd say Read to Death. Well Read Then Dead. Strangely I have the second two books but can't start until I have the first! Thanks for the opportunity. Rlewis11797 (at) yahoo (dot) com. Thanks to Terrie Farley Moran for her generous offer. I don't have either of the books so I'd be happy with any one of them. Thank you for including this giveaway on your blog. I enjoy reading about new authors and their books on it. I would love to have Well Read, Then Dead. Thanks for the chance. Well Read Then Dead although I would love either one. Thank you for this opportunity. I'll love to win Caught Read-handed. Thanks for the contest. I would love to win Well Read, Then Dead. Thanks for the chance to win! Your books sound great! I would love to read Well Read, Then Dead. Thanks for having the giveaway. I wouldn't be able to choose in a bookstore, so either one. Caught Read Handed. I would not be caught read handed without a book in my hands. I'd like to read Well Read, Then Dead, thanks for the chance. Caught Read Handed would be wonderful to win. I love buttermilk pie. And I would love to win well read, then dead! Thanks for this amazing giveaway. I'd be happy to win either. Caught Red Handed would be my preference. Does not matter which book. I would love to win. Thank you for the chance. I haven't read caught red handed yet. How exciting! I would love either but would love to start with Well Read then Dead. Thanks for the chance. I'd take either one since I don't have any books in this series. I would love Caught Read Handed or Read to Death. This is such a great series! Thanks for the chance to win!! Would like to read "Caught Read Handed". Thanks for the chance. I would like to read "Well Read then Dead". Thank you for this opportunity! j(dot)marshall730(at)yahoo(dot)com. I haven't read them yet, so I would love any! I'd be thrilled with either book thank you. I would love to read "Well Read then Dead." Thank you for this opportunity. Well Read Then Dead, since I don't believe I've had the chance to read it before now. christineocheallaigh(at)yahoo(dot)com. I'd love to read this as I love books that feature books in some way or the other. I have not read either one and would be delighted to read either of them. Thanks for the chance. Thanks for the give away. I haven't read either book so I'll leave it up to you if I should win. I am thrilled to see so much interest in the Read 'Em and Eat books. She's a new author to me so I'll pick "Well Read, Then Dead" but they all look good to me. Love these cozies. Thank you for the give-away. I would be thrilled to receive either one. The characters sound like a hoot and I can definitely relate to interfering relatives. I haven't read this series, so I guess I'd start with the first! Well Read then dead! My kind of series...bookstores and cafes!!! I've always wanted to have a bookstore, and have my sister run/operate a bakery/café in it! 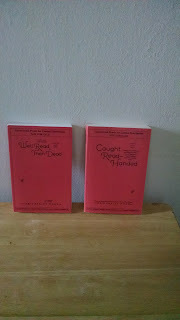 I love this series and would love to have a copy of Caught Read Handed. Thanks. Giveaway is closed. Winners have been notified. Keep an eye at Killer Characters to hear from lots of fun characters and a chance at more giveaways!